Before I begin, I must point out I didn't venture to Scotland to see this remarkable bird or witness its demise – there would never be a situation whereby I could drop everything and fly/drive/hitch a lift to the Isle of Harris in the Outer Hebrides of Scotland. I still find it remarkable anyone is able to do that, to be honest. 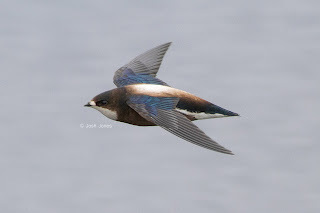 While I didn't see it I felt compelled to write about this White-throated Needletail, the world's fastest bird in flight. There’s been a May 23rd Marmora’s Warbler, a 24th May White-tailed Plover, a May 25th American Kestrel (don’t ask any questions about that…) and ~ for many, one of the ultimate grip-backs for the current generation ~ a May 25th White-throated Needletail ~ the Quendale bird of 1984 appearing on that date…. Another record of the ultra-fantastic species (the same bird presumably) came on May 26th 1991 (seen in Kent, then also in Staffordshire, Derbyshire and Shetland…) and on May 27th 1985, one famously spent a little time over Fairburn Ings in West Yorkshire while, yep, you’ve guessed it, May 28th saw the appearance of the most-twitched (doubtless it really was one-in-the-same for years) White-throated Needletail to date ~ the bird on Hoy, that spent 12 days cavorting at high-speed around the island, dodging the occasional Peregrine attack….and drawing rounds of applause with every overhead pass it made. Happy memories indeed!!! Y’know, there’s more than just those four species to mention, but when you’ve got to Needletail you kind of grind to halt don’t you. How can you top that? It remains the ultimate British rare for those who’ve scored one and we are approaching the prime arrival time. Sadly, the last sighting came in 1991 ~ and there’s not been a sniff of one in the 22 years that have followed. And then of course, on Tuesday evening this week one was reported seen on the Isle of Harris. 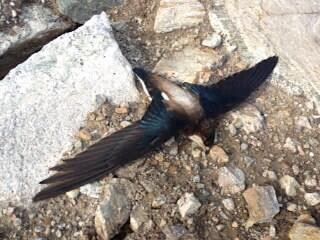 But no matter how he describes it, this bird was indeed a show-off, appearing to perform in front of its audience. What a bird. Utterly beautiful. I wish I had been there to see it. If I never saw another bird, I would've been happy if this had been the last one. As this super mega bird was playing to the crowds, I was heading to the Isle of Sheppy, a place my wife described eloquently as 'the arse-end of the world'. She may be right, but the birdlife can be amazing – but not in this instance. We'd travelled through traffic in the hope of seeing a Black-winged Pratincole that had dropped in at the Swale Nature Reserve during the late morning. I made the glaring error, however, of not keeping up to date with reports on its whereabouts when I left the house at 4pm. I was unaware when I pulled up in the reserve car park at 5.30pm that it had flown off at 4.10pm, heading west. Idiot. I was shocked. Dumbfounded. After all the excited reports coming through of how brilliant it had been, now this. Birding pal David Campbell had driven up from Banstead overnight with friends and had just arrived after nearly a 13-hour journey. He then watched as the Needletail flew directly into a wind turbine and was killed instantly. After that David became the birding spokesman on this story, and has been featured on BBC Radio 4, the BBC news website, Daily Mirror and many other media outlets. So remarkable coverage of this incident which, by way of a tragic accident, has brought the birding world into the media spotlight. It's such a pity it couldn't have been for a better reason.